“Energy Dance” or “Energy Medicine Dance”™ is a form of movement based upon the Energy Medicine work of holistic healer, Donna Eden. Titanya, Donna’s daughter and the original creator of Energy Medicine Dance, began to work with her mother, in Donna’s international workshops,17 years ago. She is now on the faculty of the Eden Energy Medicine Certification School, where she teaches and conducts ceremonies. Early on Titanya saw that the students needed a better way to remember the Energy Medicine exercises, so she created Energy Medicine Dance™ to bring more flow and joy, as well as increase the health benefits of normal movement with Eden’s exercises. Feeling that these exercises were like a chore for some (like remembering to floss your teeth, which isn’t enjoyable for everyone), Titanya added world music to the energy exercises for a more organic flow and Energy Medicine Dance™ was born! Energy Medicine Dance™ decreases stress hormones and increases feel-good endorphins, giving your whole energy system a natural energy boost! Dancing and movement turn on the body’s natural feelings of pleasure and eliminate the “fight or flight” response that we can get from daily activities such as work, driving and sometimes managing stressful personal relationships. Energy Medicine Dancing balances all the systems in the body including Chakras, Meridians, Five Elements and turns on what Donna Eden calls the “Radiant Circuits” which are “Joy Generators” throughout the body that make you naturally smile and feel good. “You need these endorphins running through your body because they can help you heal quicker,” she says. 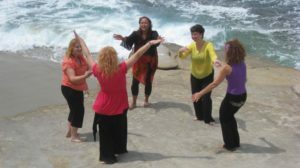 Energy Medicine Dance™ is a whole-body joyous workout that is a combination of world dance, yoga, stretching, aerobics, visualization, breathing and ancient-inspired exercises set to uplifting world beat music. 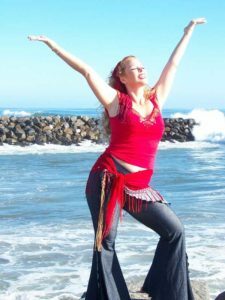 Titanya has incorporated her life-long career, and love of, world dance with her knowledge of healing and personal empowerment, then blended her Mother’s natural healing work of Energy Medicine, to give your body, mind and spirit a full body workout. With world music and fun beats, you begin to find your own “funky flow”, freeing the body through breath and ease to heal your soul’s wounds from the inside out. Help you find your own empowerment, in different ways. Show you how to move organically, exploring and cleansing the body’s chakra system, freeing the emotional scars of your own life’s journey. Connect you to your body’s meridian pathways, through yogic like exercises. Teach you about the knowledge of the Energy Medicine basics, including the stories of the chakras, meridian archetypes, the Chinese five elements and the emotions in the organs they govern. Share different techniques of stress-management knowledge through acupressure and lymphatic points in Eden Energy Medicine. Guide you in creating art and write in journals to follow your own soul’s growth and awareness. Prepare you for tuning into your right brain, letting go of the outside world for a while and retreat into your own body awareness. 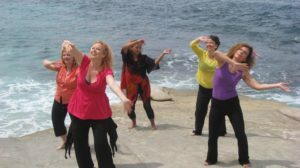 Energy Medicine Dance™ helps you to strengthen your self-esteem and connect to your body in a new way. It can motivate you to envision your goals and awaken your senses through guided visualization and dance ritual that Titanya leads you through. Participants in her workshops also become part of a healing and supportive community as they witness and move in-between, and with, each other. Many emotions arise from crying to laughter, until they are released through dance ecstasy and are fully cleansed, balanced and brought to a happy, more peaceful place. The dancers become the creators of their own inner journey as they move freely, finding the authentic movement of who they are in that present moment. It’s a great experience! 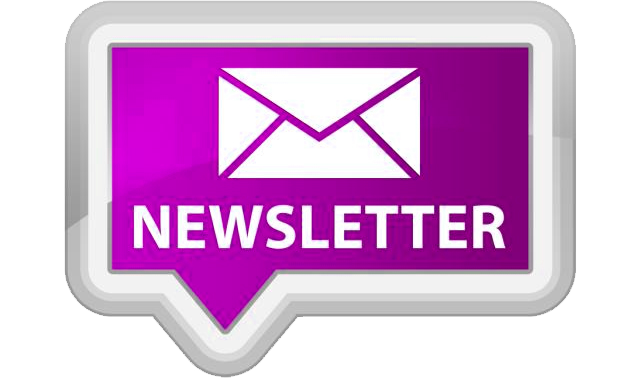 Energy Medicine Dance™ is for everyone! Every size, Every age, and can even be done in a chair or in bed! You do not need to be a dancer to experience it! Titanya has been teaching Energy Medicine Dance™ for more than 15 years. Her popular DVD’s have sold all over the world. She has taught to crowds as large as over 500 people and as small as a few lucky individuals in workshops around world. Some of the sacred places she has taught at include: Omega Institute (for over 12 years), Esalen Institute, Feathered Pipe Ranch and the International Body, Mind, Spirit festivals and so many more. Titanya, a Waldorf teacher, also instructs workshops for parents and teachers, and is co-writing with her mother, Donna Eden, the book Energy Medicine for Kids, and their Parents too!